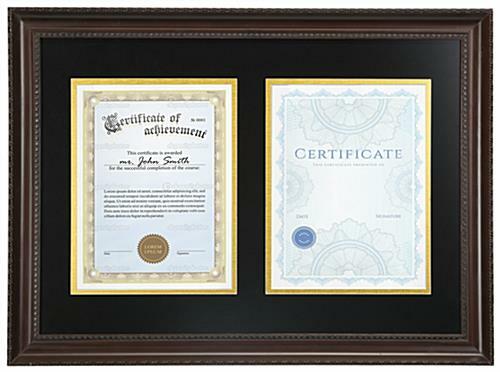 This dual certificate display is a double matted and elegant frame for professional licenses, diplomas, or corporate award presentations. 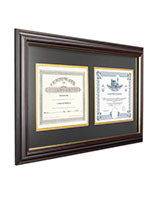 Each economical frame is made of brown plastic and features two black matted 8.5" x 11" openings with gold trim. 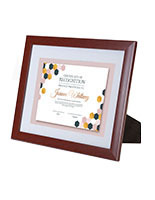 The versatile certificate display is designed for wall mounting in either portrait or landscape orientation. 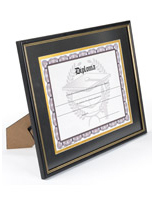 The license holder will hold (2) 8.5" x 11" professional certifications, diplomas, or awards when matted, or a single 15.5" x 22" graphic when the mat is removed. 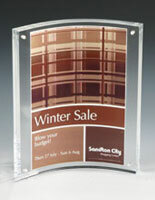 The lightweight plastic construction includes an acrylic lens to protect contents from dust or damage when mounted. 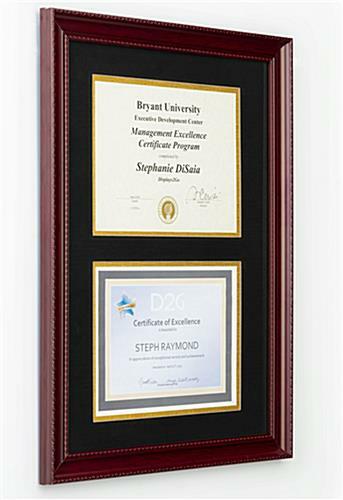 This type of enclosure with multiple openings is a superior choice for showcasing related awards or certifications, such as high school, college or university, or professional performance recognitions, specialty training classes, or business licensing. 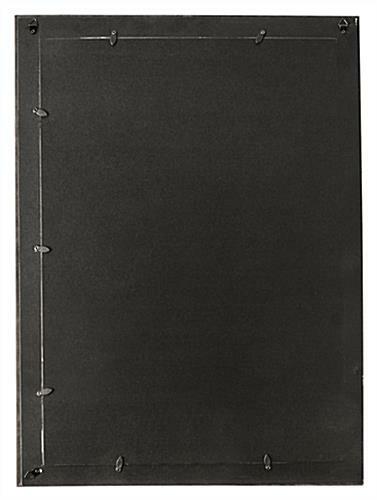 27.0" x 18.3" x 1.3"
8.5" x 11", 15" x 22"
** FALSE ADVERTISING!! ** DO NOT BUY THIS PRODUCT! 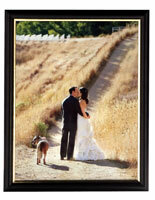 Was lured in by the low price and seemingly good-quality picture and description, BUT: 1. 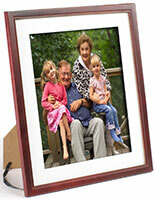 The "wood" frame is actually plastic, extremely cheap-looking, and cheaply molded / bent!! 2. 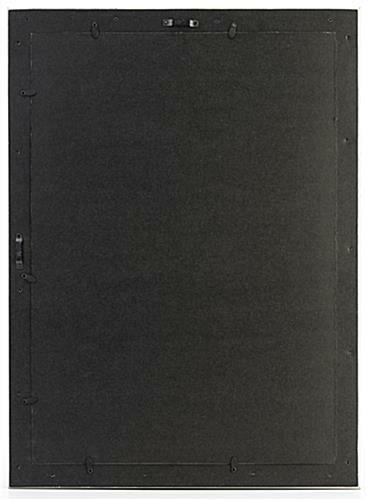 The seemingly good-looking black matte is actually made of felt, is extremely cheap, and attracts all possible kinds of dirt and fuzz! 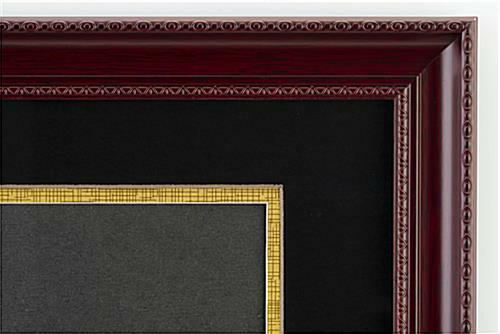 In addition, the gold trim matte is very cheap-looking and cheesy. 3. Worst of all, the "glass" frame is actually PLASTIC, and cheap, hard-to-see-through plastic at that !!! I felt 100% cheated by this company. 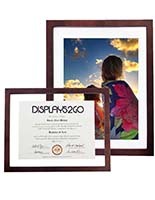 I will be pursuing further action against this seller, and had to spend a lot more money to have my items professionally framed after unfortunately buying this. Please learn from my mistake and DO NOT BUY THIS PRODUCT !!! Hello Tom. We are sorry to hear that there is a discrepancy with this product. It is certainly not our intention to have invalid information on our site and we will work quickly to resolve this. A customer care representative will be in touch shortly to work with you on your order as we work internally to address the discrepancy on the page. Thank you for identifying this for us so we can correct it!